Prostyle are teaming up with the Sailor Moon series to release their product with five limited edition Sailor Moon designs on October 25. An early look of the designs was unveiled on October 19 via Prostyle’s official website. 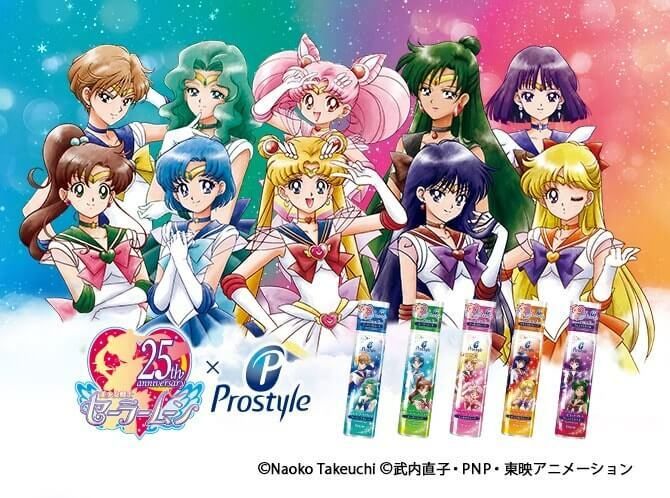 This is the second collaborative between Sailor Moon―which has captured girls hearts the world over―and Prostyleーwhich is the number one selling brand of hair mousse and foam in Japan*. The first design collaboration back in May this year was so popular that they decided to do another. *Figures taken from Intage SRI. Sales between January 1997 to June 2017. There are five products being release each with two characters from Sailor Moon on them. On the Prostyle website the characters recommend why you should choose the product in their own words so you can bring out a hairstyle that is you. Create beautiful and elegant wavy hair with no water at all, just the foam itself which has plenty of moisture in it. This foam keeps your hair in place, ensuring it isn’t affected by the wind or the rain. Your hair will retain its natural feel without becoming hard and sticky. Can easily be used with updo hairstyles too. This is a glossy foam of whipped wax which can be applied lightly to even loose perms, all the way down to the tips. Permeates straight essence in your hair, keeping it silky and straight down to the ends throughout the day. This foam permeates you with ‘moist essence,’ looking after damaged hair and ensuring it isn’t dry and brittle so you can shape your hair elegantly.